From academic innovation to new and renovated campus facilities, retiring Dean Stephen Bowen has led Emory's Oxford College through more than a decade of growth and change. For the 11 years he has been at the helm of Oxford College, Dean Stephen Bowen has lived up to Haygood’s challenge. 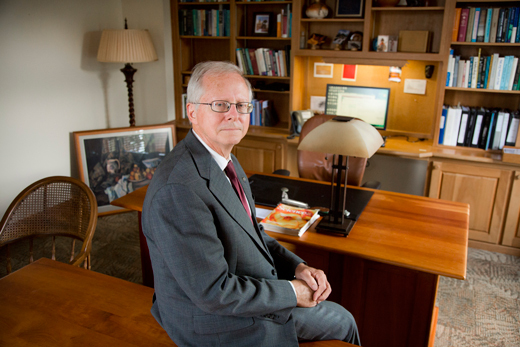 Bowen retires at the end of May, leaving behind a legacy in which the bar has been raised in every aspect of the college. Joe Moon, dean for Campus Life and historian of Oxford College, recalls that from Bowen’s first days as dean it was clear that he understood Oxford. Moon compares his leadership as Oxford dean to the craftsmanship of the pieces that Bowen has created through his avocation as a woodworker. “Though it may be dramatic, even messy, in the first stages, slowly and methodically the bowl emerges and adjustments are made; he never loses sight of the vision of what the bowl should be," Moon says. That vision is most dramatically evident in Oxford’s physical space. Since Bowen assumed the deanship in 2005, the campus has undergone some $120 million in improvements to its facilities. Hugh Tarbutton 84Ox, immediate past chair of the Oxford Board of Counselors, says that Bowen’s tenure has been transformational. Under Bowen’s leadership, Oxford’s academic profile has steadily risen. Applications for admission to Oxford have increased to seven times the number in 2005, resulting in an increase in enrollment from 680 in 2005 to 936 in 2015. Over that same period, students’ level of preparation for college-level study improved dramatically, with average freshman SAT score up from 1194 in 2005 to 1336 in 2015. The number of full-time-equivalent faculty increased from 47 to 76. The past 11 years have also seen academic innovation at Oxford, a testament to its emphasis on teaching and the scholarship of teaching and learning. The Center for Academic Excellence (CAE) was established in 2007 to support faculty development, teaching initiatives and the enhancement of the Oxford learning experience. The CAE in turn has helped to advance Oxford’s reputation for teaching and learning through its annual Institute for Pedagogy in the Liberal Arts, now in its tenth year and attended by faculty from across the country. Oxford adopted its distinctive Ways of Inquiry curriculum, active-learning courses in which students learn the fundamentals of a particular discipline, while also learning to understand and question the ways in which knowledge is pursued. Athletics, health education, fitness and credit-bearing courses on recreation and physical education were consolidated into the Center for Healthful Living (CHL). Through its wide range of physical engagement and education, the CHL promotes lifelong health through helping students to understand the multiple dimensions of fitness and wellness. In addition to the restoration and renovation of Phi Gamma (built in 1851), Williams (1907), Seney (1881), Hopkins (1885), and Language (1874) halls, the President’s Home, the oldest structure owned by Emory University, was spared from being torn down or re-purposed. Built by Emory founder and first president Ignatius Few in 1837, the house has been the traditional residence of Oxford deans since 1919. When Bowen came to Oxford in 2005, the structure was in need of extensive repair, and the university offered to build a new, more modern residence. Bowen’s wife, Nancy, urged instead that the University restore the President’s Home and preserve a significant piece of Emory’s history. The result is a warm and gracious home where events have been regularly scheduled to ensure that every member of the college community has the opportunity to visit. Bowen’s vision in using existing assets wisely is also evident in the Oxford College Organic Farm. Located on 11 acres adjacent to the campus, the farm was donated to Oxford in 2011. There are many things a college can do with a windfall of land, but it was Bowen’s idea to turn it into an organic farm, a place dedicated to the practice of sustainability and where students could learn something about how food is produced and gain real-world experience beyond the classroom. The farm is an important asset in the local community, providing fresh, local produce through its community-supported agriculture (CSA) program. Hundreds of students have experienced the farm through its incorporation into curricula across several disciplines. During Bowen’s years at Oxford College, ties to the city of Oxford were strengthened, with the two entities working together on many fronts. Meetings to discuss shared concerns became a regular part of the schedule for both Bowen and Oxford Mayor Jerry Roseberry. “The city of Oxford and all of Newton County have benefited greatly from Steve’s leadership," Roseberry says. "Shortly after his arrival, Steve made it clear that he considered the college to be part of the larger community. He and I shared the belief that cooperation and collaboration were essential if the community was to benefit fully from the efforts of both. And despite the progress under his leadership, Bowen still wants even more for Oxford. “I often hear it said that ‘Oxford is in a good place,’ and of course I agree," he says. "But Oxford has not yet fulfilled its potential or realized its mission. Progress over the last decade has strengthened the college and removed many constraints. Editor's note: Douglas A. Hicks has been appointed as the next dean of Oxford College. Hicks will assume his new role on July 15. He comes to Emory from Colgate University, where he has served as provost and dean of the faculty and currently is senior adviser for academic initiatives and professor of religion.